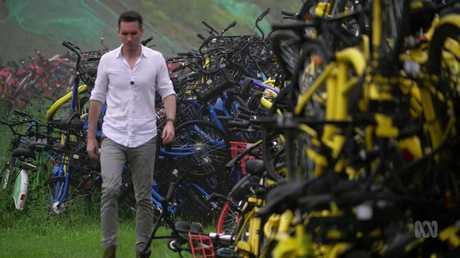 Foreign Correspondent reporter Bill Birtles stands in one of China's bicycle dumping grounds outside Beijing. 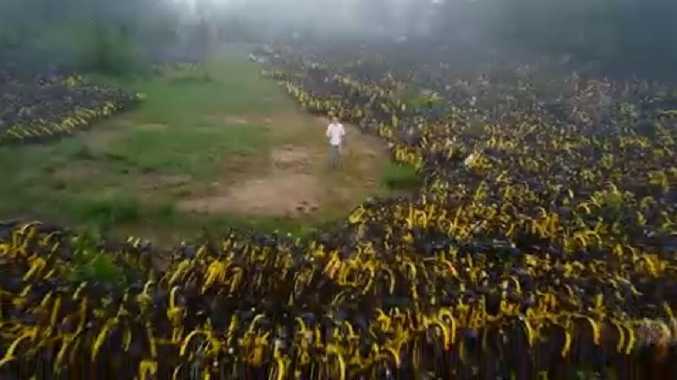 FOOTAGE of a bicycle dumping ground in China has revealed how bad its waste problem has become and the challenges the country faces in dealing with it. 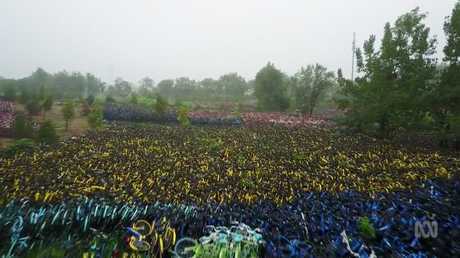 Drone footage of the dumping ground outside Beijing was aired this week on ABC's Foreign Correspondent and shows never-ending stacks of broken and discarded bicycles used in share bike schemes, piled high in a field for as far as the eye can see. It's just part of the mammoth waste problem China is grappling with, which sees one of its biggest cities, Beijing, churning out more than 25,000 tonnes of rubbish a day. Adding to this is the rising popularity of food delivery, which now sees about 60 million takeaway food containers being thrown out across the country. "The volume of takeaway food packaging has increased very rapidly, very dramatically," Eric Liu, a campaigner at Greenpeace, told Foreign Correspondent. As food courier Rao Jian explains: "It's easy and convenient - people want to rest after work. 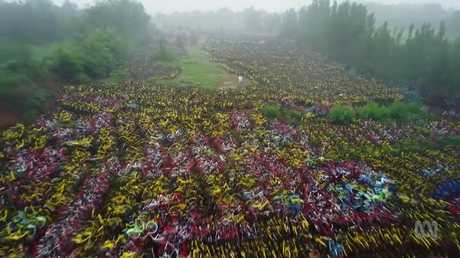 If they order delivery, it will save them time." China's waste problem has seen it crack down on taking foreign rubbish for recycling and a ban was introduced on January 1. But the ban has caused huge disruption to the recycling industry worldwide, including in Australia, with recyclers of paper and plastic impacted in particular. About 1.3 million tonnes of Australia's recyclable waste used to be sent to China. Companies are now figuring out what to do with it as about 99 per cent of it will no longer be accepted due to tighter restrictions on contamination from non-recyclable items. While it only made up 4 per cent of all recyclable waste in Australia, China's ban impacts paper and plastic recycling in particular. About 30 per cent of all paper and cardboard and 35 per cent of all plastics collected from household kerbside services used to be sold to them. The ban has effectively made many of these products almost worthless as there is no market for them. It now costs more to collect the some of the items than what companies can make back on the recycled products. In response some state governments have created rescue packages to help councils keep their kerbside recycling services going. Companies are also stockpiling the products until they can figure out what to do with all the waste. RELATED: What can you recycle? Governments and industry are scrambling to find solutions, with state and federal environment ministers agreeing in April to a target of 100 per cent recyclable, reusable or compostable packaging in Australia by 2025. 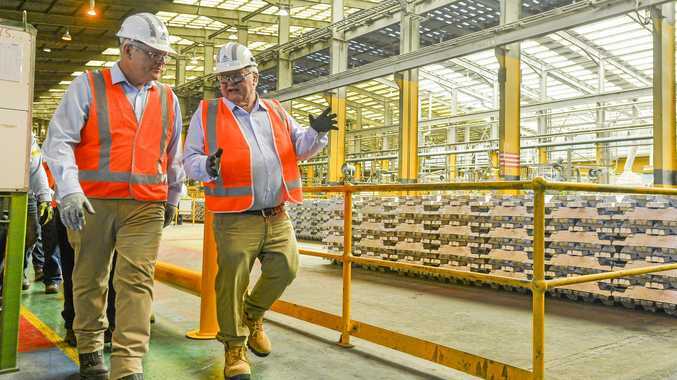 Environment Minister Josh Frydenberg said governments would try to find other ways of developing Australia's recycling industry and to process the 4 per cent of recyclable waste that would have previously gone to China. To increase demand for recyclable waste, ministers will try to increase the use of recyclable materials in goods purchased by governments, such as paper, road base and construction materials. Ministers also agreed to fast-track the development of new product stewardship schemes for photovoltaic solar panels and batteries, which encourages companies to take responsibility for what will happen to their products once they no longer work. The review of Australia's National Waste Policy will also be brought forward and completed within a year. In addition, the Clean Energy Finance Corporation and Australian Renewable Energy Agency has been asked to prioritise "waste-to-energy" projects, building on the around $200 million already invested in this area. Generating energy from waste that is unable to be recycled is common in other countries, particularly in Europe.